I have always been reluctant to write down and submit an experience like this, due to two reasons. Firstly, because I don´t feel very comfortable expressing something which is so personal. And secondly, because in my opinion, the perception is so disorganised or, more precisely, so differently organised from the one I have during the usual experience that the writing of the sensations, feelings and thoughts I have in a strong psychedelic experience is usually quite inaccurate and not very precise. However, I have had recently two trips that had been considerably more important than the rest, and they are so stunning that I think it could be nice to write down something about them (although this writing is short, imprecise, incomplete and inaccurate). Even though both trips are independent, and can be read separately, it is interesting how they show in some way very different facets of the psychedelic experience (although they have lots of things in common, too). The first trip is probably the most powerful experience of my life, and the second one is probably the best (and most beautiful) experience of my life. So after this introduction let’s move to the matter of this experience report: the second trip. I am a quite experienced psychedelic user (even doing psychedelics almost daily or very regularly in some periods). Previous to this trip I had had lots of experiences, specially quite a lot of DMT ones, including strong breakthroughs. I had also experimented with trips and substances in different contexts and settings. On the other side it is also important to know that my main interest in life is Geometry (also other parts of Maths), in the sense of understanding and visualization of beautiful, complicated, stunning and new, geometrical phenomena related to intersections, hypersurfaces, higher dimensions, etc. I am a String/M-theory and Algebraic Geometry researcher. I am a String/M-theory and Algebraic Geometry researcher. This intellectual/professional interest is also my main interest about the psychedelic experience and without it you cannot understand why this concrete trip was so significative to me. As an aside it is normal to understand part of my interest in DMT, taking into account its visual and geometrical richness. For example quoting PsychonautWiki: “The geometry present with smokeable DMT is considered by many to be the most profoundly intricate and complex set of visual geometry found within the entirety of the psychedelic experience”. I live alone in my house. On this occasion I was sitting at my desk with my laptop and several monitors showing different images, papers and videos about nice, colourful and intricate geometric visualizations (including representations of higher dimensional ones). The lights of the room were completely on (I wanted a bright, clear-coloured scenario) and although it was quite hot I was wearing a lab coat (for two reasons: I love hot weather, and the coat gives a futuristic taste for my imagination). I had been thinking and meditating abut some geometry stuff. At the beginning I was not very relaxed, but neither too nervous. Previous to the main trip, once I had already prepared everything I did a first trip (my intention was doing several). That trip was also quite interesting on its own but it turned to be just a prologue of what was going to happen :) so I am not going to detail it here. I smoked slightly more than 40 mg in my GVG quite properly during a nice time. It was considerably powerful and I had quite a strong breakthrough. I was transported into an HYPERDIMENSIONAL 7-D world and my mind was amazed in happiness and saturated (in a good way) in geometrical blooming and celebration. The process was the following: at the beginning I started to feel heavy (specially my chest and shoulders) and I started to sink in my chair by sliding with my right shoulder following kind-a-circular path. At the same time the visions started to appear and a new scene was overcoming the physical “real world”. A circle line appeared and then a circular-like yellow/orange/gold figure/scene started to emerge (at that moment, my cited path followed circular directions inside this figure/scene). Then the figure/scene became more ample and got spherical, keeping on becoming more and more ample gradually. As this was happening I felt a bit uncomfortable because I felt a bit trapped (I almost felt like a physical attraction to some point) and my movement capability a bit limited -in fact the real displacement occurred when I moved in a touch way, imagining I was moving my shoulder/chest (I felt that I only could move in some kind of circular directions contained in the spherical-like figure/scene I was in*) . But that feeling of uncomfortableness lasted quite short as I soon realized that I have been compactified by the DMT entities. (The sense of touch played an interesting role in this compactification process). *This constraint on the movement dissapeared later when the hyperdimensional character of the scene imposed itself. By that moment I was able to move and displace freely in the 6(7) dimensions (or I had a delusion/perception very similar to that). I had the eyes closed and the [CE]-vision was reaching its peak. In that moment I was absolutely amazed and exultant and just by the moment when the visions reached their maximum peak I was submerged in a complete happiness and stunningness because, as I said, ***I was transported into an HYPERDIMENSIONAL 7-D world and my mind was amazed in happiness and saturated (in a good way) in geometrical blooming and celebration***. I could perceive like 7 dimensions at the same time: there were a 4D normal scene (counting time as a dimension) plus a 3D scene (the yellowish kind of geometric one (spherical with also some other figures -- maybe some kind of cylinders arranged across different hyperplanes -- everywhere) and both of them were overlapped and inserted in the same sight/scene/space, like in a 7-manifold, and I perceived each of the 6 (7 with time) dimension as an independent direction (which is indeed the definition of dimension). I have just said that I I saw in 6 spatial dimensions. Probably I wouldn´t say so, but it was a very similar illusion (and extremely beautiful and stunning). There were several DMT effects playing a role, at least these three (and more of them for sure): superposition, denser image/space/reality and autosuggestion of extradimensional perception. The most important was the first one. It had been present in several DMT trips but in this time it was elevated to its maximum power to the point of being almost qualitatively different. It is quite useless to try to explain the entire thing but I can (inaccurately) describe several components of it in order to give a glimpse. One partial analogy (and it is just a distorted approximation, like a parably or a projection to some inferior dimension) can be the following. 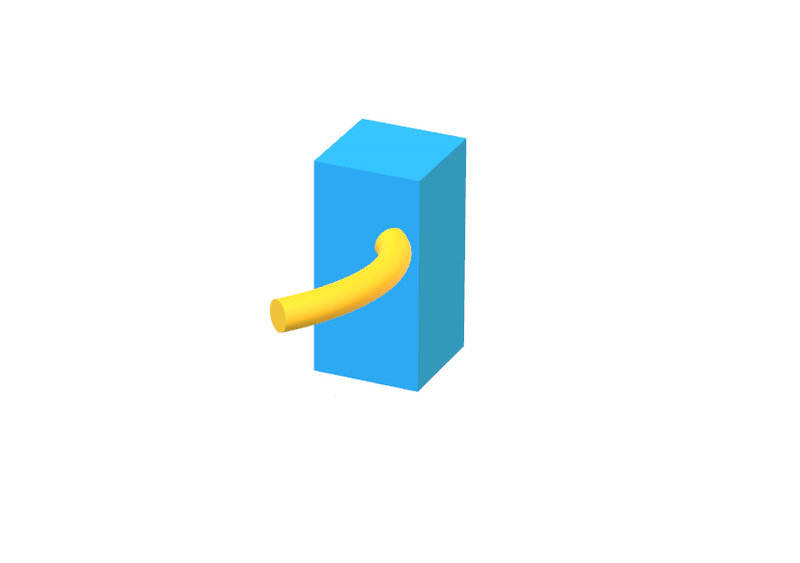 Imagine that the exterior scene and the exterior dimensions are symbolized by a rectangular clear blue prism (3D) and the other dimensions are symbolized by a curved yellow cylinder, like a ¼ of a slim torus (counting the interior of it, so we have another 3D figure and an a result 3+3=6D). The figures are arranged like in this figure. Imagine that you see at time t0 the figure 0. Then you see at time t1 the figure 1 and at time 2 the figure 2. The geometrical perception is so accelerated, blooming, rich and exalted and both images are perceived so fast, with such a short period of time t2-t1 that the brain almost thinks that it perceives them at the same time. 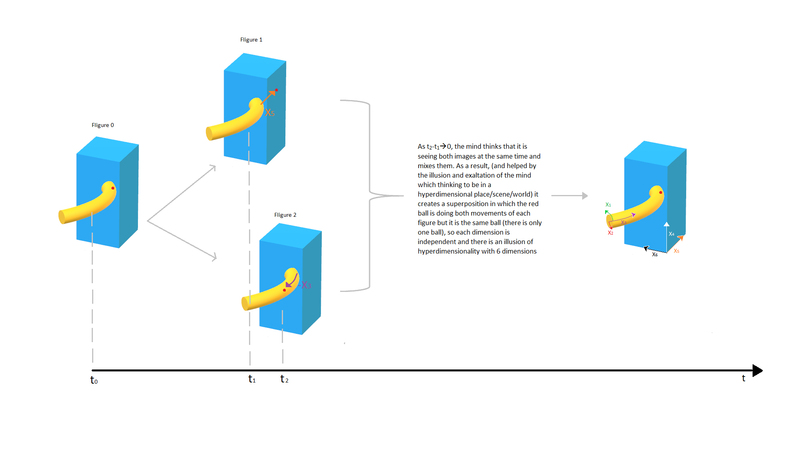 So it interprets that both the ball of figure 1 and the ball of figure 2 are the same ball, moving at the same time both along the direction X5 in the prism and in the direction -X3 in the cylinder. Helped by the autosuggestion of being in a hyperdimensional scene/sight the mind thinks that that is possible because they are independent dimensions (directions). I had done a breakthrough as the reality - together with my role in it - had gone completely. It was certainly a more progressive, not so abrupt, breakthrough than the average of my breakthroughs (I think that this usually happens to me when I connect two breakthroughs quite nearby in time, in such a way that I don´t give enough time to my brain to stop being high). Anyway at some point, when I was already compactified and I was experiencing the hyperdimensional thing, I was in another reality. I was in the hyperspace, but in this time, unlike the other trip the most accentuated facet of hyperspace was clearly the hyperdimensionality rather than (what I call) the hyperreality, although both of them were present. As I was coming back to reality I thought that the DMT entities had explained to me and let me feel compactification and extra dimensions in a way that my limited brain could understand. I had perceived with all the senses (sight, touch and all the others) and in a beautiful way the 6(7) different dimensions, in an amazingly beautiful hyperdimensional scene. Then the visions and other things started to ease off little by little. As long as the main thing was ending I started crying with happiness... there were also secondary visions... I do not remember the entire thing, neither all the visions and sensations I had during the trip. I certainly remember that as I came down I was extremely exultant. I felt like my neurons were saturated in joy and in geometrical richness. I felt like my neurons were saturated in joy and in geometrical richness. I was crying for happiness and when I closed my eyes lots of 3D multi-colloured geometrical figures formed, lots of planes and other things turned around and intersects among them in incredibly beautiful ways, they came to the center of the image and spheres arose in their intersections from the center and expanded along all the image. This image lasted quite more than usual when I am becoming sober. All the experience… it was so so so extremely BEAUTIFUL, so amazing… I didn´t know I could ever experience that amount of beauty. It was so pleasant and beautiful that after all, the first thing I did when I recover my consciousness was crying with hapinness and sob “so beautiful!””, “oh my god!!”... I even screamt a crazy strong shout “It is so beautiful, GOD!, GOOOOOOOOOOD!!!!!!!!!! !” In fact I recorded some of the reflections, descriptions (also some of the sobs and screams) to capture a bit of the moment and help me to remember some things. As an aside: it is interesting to remark that I am a person with a very pro-futuristic world attitude, in the sense that I believe in transhumanity, mind uploading and other scientific marvels, and I think that in remote future human beings will be able to live, perceive and feel extraordinary, mathematical, scientific, stethical [esthetic?] experiences. In this context the experience in this report encouraged me (even more) to keep on exploring Geometry, String/M-Theory, Algebraic Geometry, Mathematics etc and to try to participate in that future. It is interesting that to maintain this kind of experience as a constant state of the brain would be quite similar to some kind of paradise. Maybe it will have to be complemented with some elements or inputs that help to maintain a constant train of thoughts if necessary because, even though lots of rich conexions appear in the psychedelic experience, they sometimes manifest a lack of linearity and focus (in some aspects) which would be nice to be enhanced or corrected. Also, in a slightly more practical way, I will explore geometrically some of the visual/geometrical/perceptive effects and thoughts that appeared in the trip, and they could also be useful in the future in the context of trying to build illusions or simulations of hyperdimensional perception. However, regarding this direction, it seems complicated to accurately replicate this kind of illusions without the component of autosuggestion of the brain that had been present in this trip, it would need lots of precision. At last I had had the mythical-unimaginable-indescribable-best-experience-ever that changes your life I had always read about in some DMT and other psychedelics reports. I didn´t expect it after so many trips and psychedelic experiences (which I had had in quite different moods and moments). This eventuality could be caused by different things (and of course, pure luck played a role). One of them may be that I had had some of the obsessions and loops/bad ways of thinking I was worried about previously (like the ones previous to the other trip I reported). Anyway it was incredible. Now, after all of that I almost don´t know what to do. It is like “You have been born, raised, thought, felt, worked, and now you have lived that… so… it is OK, you can already die”. In fact some days later I took a plane and when it was taking off I thought for a moment that if the plane accidentally crashes I wouldn´t be very worried, I can pass away quite realized and satisfied... ahahahaha. On the other side I had let a quite long period of time (and still some time left) in order to assimilate it, enjoy and celebrate what I have lived, let it rest, integrate it, write a bit about it etc. Once I have done a (partial) analysis I almost surely will keep on doing psychedelics, but this was indeed a profound before and after.